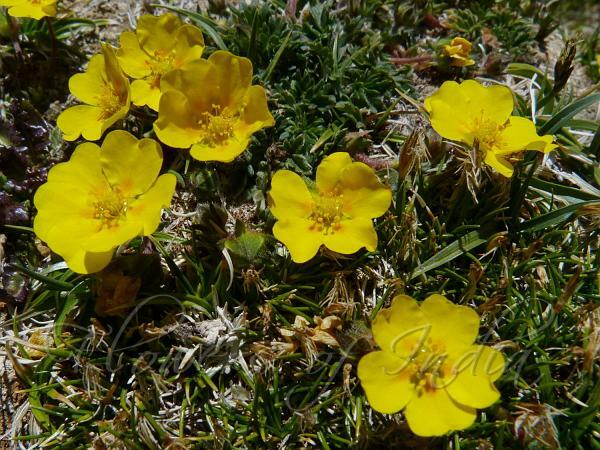 Pamir Cinquefoil is a perennial herbs with bright yellow flowers 1-1.3 cm across. Sepals are densly hairy. Petals are 5-6.5 mm long. 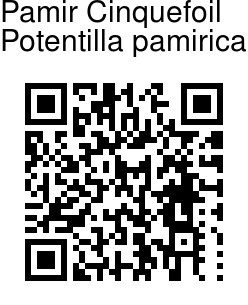 Stamens 20-25. Rootstock is much divided. Flowering stems are many, tufted together, 5-15 cm long, slender with thin silky hairs. Basal leaves mostly adpressed together at the base, 3-4 pinnate, stalk 8-12 mm long, hairy. Basal stipules are membranous, dark-brown, auricles ovate-lanceolate, stem stipules are leafy, entire or 2-3 divided. Leaflets are 5-15 x 4-6 mm, upper surface sparsely to densely silky hairy, lower surface greyish velvety, 2/3-3/4 divided, lobes 4-8, approximate, 1.5-2 mm broad, obovate obtuse. Carpels are numerous, styles uniformely thickened about 1-1.2 mm long, subterminal. Pamir Cinquefoil is a fairly common plant in the upper drier alpine zone of N. Pakistan and Kashmir at altitudes of 4,000-5,000 m. It is common in Ladakh. Flowering: June-July.